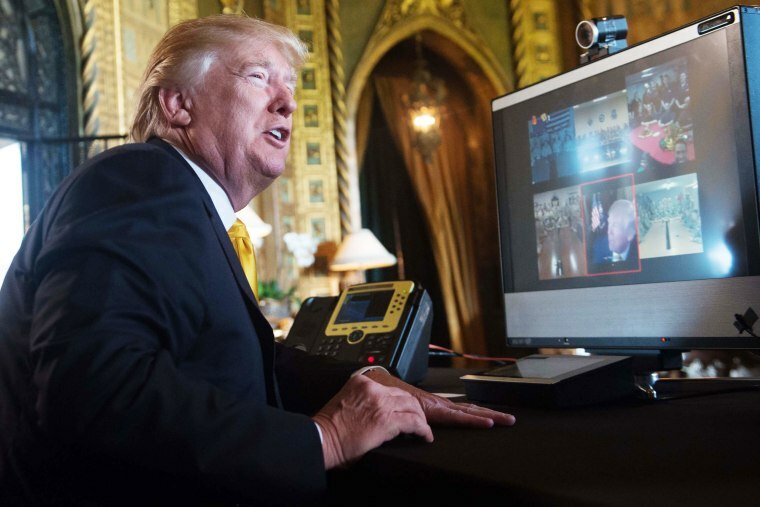 WASHINGTON — In a Thanksgiving morning video-conference call with servicemembers overseas, President Donald Trump expressed his gratitude for their work, took credit for allowing them to do it and sought to assure them that they'll find prosperity when they return. "We’re doing well at home. The economy is doing really great. When you come back, you are going to see with the jobs and companies coming back into our country and the stock market just hit a record high," Trump said, reading from a prepared script at his Mar-a-Lago resort in Florida. "Unemployment is the lowest it’s been in 17 years. So you’re fighting for something real, you’re fighting for something good." The remarks were unusually political for an American president's Thanksgiving address to troops but perfectly in line with Trump's penchant for making such statements to nonpolitical public servants. On the line with Trump: The first brigade combat team of the 82nd Airborne, which is operating in Kandahar, Afghanistan; the Direct Support Team Gulf of the Marine Corps Special Operations, 2nd Marine Raider Battalion; sailors aboard the USS Monterey; the Air Force's 74th Expeditionary Fighters Squadron at the Incirlik Air Base in Turkey; and the Coast Guard forces aboard the Wrangell near Kuwait. "As we give thanks for this holiday, I know I speak on behalf of all Americans when I say that we totally support you — in fact, we love you. We really do. We love you," Trump said. Turning to specific missions, Trump told the Army soldiers in Afghanistan and the Marines in the Middle East that they've been able to achieve success because of the change in presidents in January. "We’re not fighting anymore to just walk around, we’re fighting to win," Trump told the 82nd Airborne troops. "And you people are really, you’ve turned it around over the last three to four months like nobody’s seen, and they are talking about it." He sharpened his point when talking to the Marines. "We’re really winning. We know how to win. But we have to let you win," Trump said. "They weren’t letting you win before. They were letting you play even. We’re letting you win." Trump closed by joking with the troops that he would tell the media "You're fired!" — the line he made famous as a reality TV star — before wishing reporters a happy Thanksgiving. He then departed Mar-a-Lago to visit with "coasties" at a nearby Coast Guard station.